Imagine a TV that blends in as wall decor when you turn it off. One minute you are watching Netflix and the next you are wow-ing guests with a stunning work of art. Well, pretend no more because this TV exists. The Samsung Flat Screen LED 4K UHD TV, otherwise known as The Frame, is the perfect two-in-one piece you may be looking for in your home. This smart TV has many high-quality features, such as 4k UHD resolution, LED display, and a large screen. 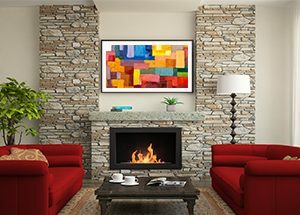 These features are highly desirable in this digital world, but the most notable feature is that when you turn off the power, The Frame transforms into an eye-catching work of art. The Frame comes programmed with a gallery of 100 professionally curated art pieces in ten different genres. You can also change the black bezel to a wood, white or metal frame to complement your home. The Frame is a flat panel designed to blend in, if not enhance your wall decor.